Large high capacity poly hopper (180 cu. in.). Infinite settings and flow control on handle. 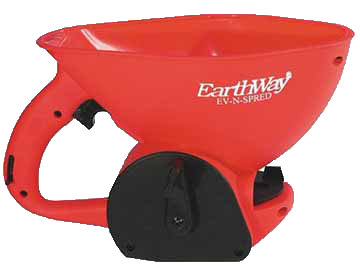 Hand operated spreader, large capacity hand spreader with 180 cubic inch capacity, makes quick work of spot spreading, or broadcasting materials. Designed with an integrated scoop design, it can scoop material out of bags or cans. Does not really work with Muckmaid. Shown as purchase with Muckmaid. It was advertised with Sparkklear so we thought it went with it. Sparkklear it a pellet it did not work with it. So he had to return it and pay a restocking fee. Everything else we get from Lake Restoration is wonderful. This wasn't.